Should you buy a 4K TV yet? | What Hi-Fi? Should you buy a 4K TV yet? Confusion over standards for Ultra HD TV could lead to the introduction of 4K being a "slow burn", according to industry experts. The adoption of 4K Ultra HD TV could be a "slow burn", says Andy Quested, head of HD and UHD at the BBC. He was speaking at the Futuresource 'New Content Horizons' conference in London, held on 2nd June. "4K UHD is not just about [higher] resolution, it's also about High Dynamic Range (HDR), better colours and sound. 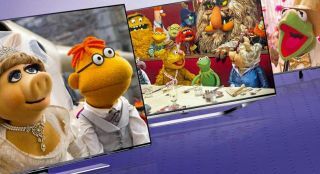 We can make UHD programmes now and soon will be able to transmit them at reasonable bit rates, so it will happen - it's not like the 3D fiasco," says Quested. "But it could be a slow burn, and I do think there is still room for a couple more updates." When asked if he had bought a 4K TV, Quested replied: "No, I haven't bought one yet - I don't think they're ready. What we have at the moment is a conglomeration of three or four different [UHD} standards all vying to get to market. There are still a lot of variables: which frame rate would you like? What kind of colour do you want? Do you want HDR or standard dynamic range? What we have now is the base minimum." He went on to add: "The ITU [International Telecommunication Union - a UN body for setting global technical standards] study period for UHD ends this July and then it will be six months before the next meeting, so in that time nothing happens. Currently there's a choice of five or six UHD standards, all of which work - but which one do you use?" Quested was joined on the 4K UHD panel at the conference by Chris Johns, chief engineer for broadcast strategy at Sky. "The question for consumers is ‘when do I join the 4K revolution?’. Which standard do you define as the de facto 4K one? As broadcasters, we have to decide at what point we offer the consumer a 4K service. Personally I'm one for the big bang approach when everything is in place, rather than introducing gradual improvements. When will we have a real, full 4K standard? We're not there yet." The official line from Sky is that "it has not got a 4K proposition to launch at this time", says Johns. But, like the BBC (which recorded the Queen's Christmas message in 4K), Sky has been playing around with 4K for some time. "The challenge is that there are different production values for, say, sport and outside broadcasts compared with drama. When is the TV screen going to be able to deliver the big step change [in picture quality]? Current 4K TV sets won't handle HDR, nor the frame rates required for films and sport." Regarding films, the BBC's Andy Quested also made the point that "there are still issues around copy protection. We don't know what Hollywood will demand and if the hardware will work with that." Simon Gauntlett, chief technology officer at the DTG, is concerned that the current somewhat confused situation around UHD standards could mislead consumers: "How do we avoid retailers mis-selling 4K TVs that may be redundant in two years? You have to be very careful in case thay are not compatible with future upgrades." "We haven't yet agreed a combination of standards to define the UHD experience," continued Gauntlett. "That is something we are discussing in the UK UHD Forum. We need some sort of UHD-Ready label. The Blu-ray Disc Association has put a stake in the ground, but the broadcasters have not. We need to wrap it up this year and agree a standard [for broadcast 4K TV]." Given that 43 per cent of consumers are looking for 4K in their next TV, according to Futuresource, that agreed standard can't come soon enough. Gauntlett's other concern is that while 4K Blu-ray will look great on a 4K TV, standard-definition TV broadcasts "will look rubbish as they are being stretched too far". As for launching new, dedicated 4K TV channels, the panel largely agreed that 4K content can be delivered in a variety of ways. "I don't see the need for any new 4K TV channel, it could be an evolution of different platforms," says the BBC's Andy Quested. " We could start 4K programming on-demand via BBC iPlayer rather than through a conventional channel." Gauntlett adds: "It will be a while before we see complete 4K channels. We are more likely to see 4K via IPTV, cable and satellite first before terrestrial platforms such as Freeview." Sky's Chris Johns points out that streaming current 4K on-demand programmes via Netflix, for example, requires a broadband speed of around 16-20mbps. Live sport and HDR content will require even higher bit rates, so the UK's broadband infrastructure will have to improve significantly. And what about 8K, already being trialled in Japan? "Broadcasters in Japan don't see the need for a dedicated 8K channel," says Quested. "Rather, they'll use 4K or 8K depending on the type of content being broadcast."